Former President Mahinda Rajapaksa says that the change of government that the people expected has now had to be put off, but pledged that the people will definitely get the “change they desire” as no one can prevent that from happening. He made these comments in a speech delivered at his Wijerama Mawatha residence this morning (15) where he signed his letter of resignation. Rajapaksa resigned from the post of Prime Minister, ending the two-month power struggle in the island country. In his speech, Rajapaksa said that after the February 10 local government election, their aim was to have a general election held. “Since I have no intention of remaining as Prime Minister without a general election being held, and in order to not hamper the President in any way, I will resign from the position of Prime Minister and make way for the President to form a new government,” he said. “The change of government that the people expected has now had to be put off. But the people will definitely get the change they desire. No one can prevent that,” he added. He claimed that the coming together of the Joint Opposition and the SLFP group that was in the government has now created a power block that commands around 54% of the vote base. 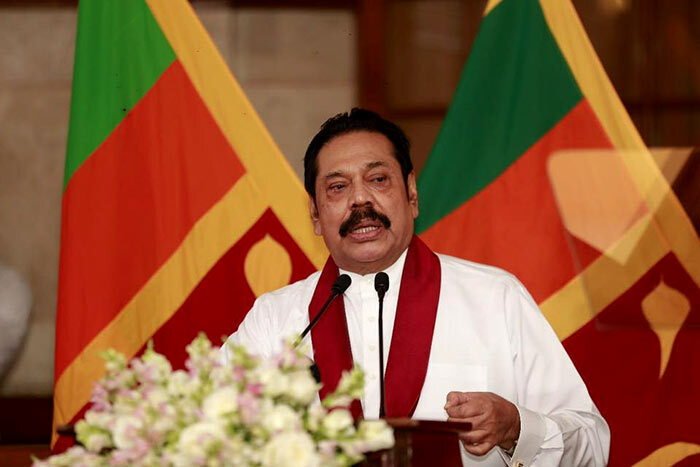 “Our main aim in the immediate future will be to hold the provincial council elections which have already been delayed by more than one year and three months,” Rajapaksa said. He said the main challenge facing them in the interval between now and the formation of a people’s government will be to “minimise the damage” that can be done by the destructive forces that are now seeking restoration to their former positions. “We will bring the forces opposed to the country down to their knees by organising the people,” he added.